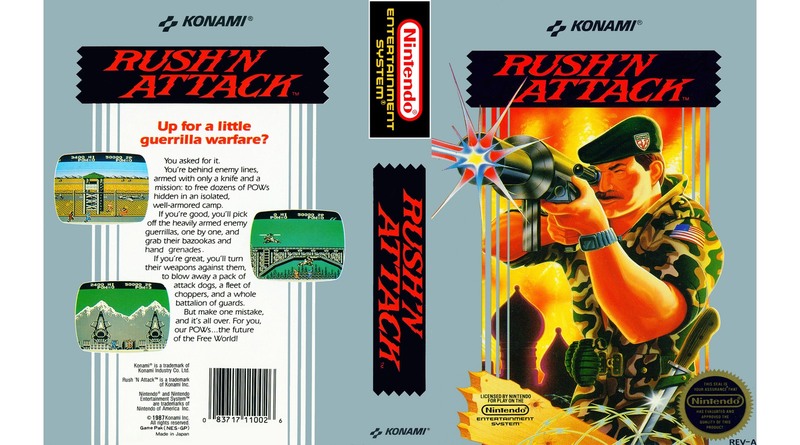 Rush ‘N Attack is the newest Game Pak by Konami for the Nintendo. Ever since they released the phenomenal Gradius last year, I have been anxiously awaiting their next title. This game is all about action and brings something new and exciting to the NES: a unique 2-player experience. Sure, this game has been in the arcades for a year, but the home version offers more levels and some other changes. Given the action and the theme of Rush ‘N Attack, this is a game sure to peak the interest of older gamers. The objective in this game is to ‘Destroy the Enemy’s Secret Weapon.” Just who is this enemy? Well, it is not exactly spelled out, but given the game’s ‘play-on-words’ title, it looks like they are the Russians. Interestingly enough, the game is called ‘Green Beret’ in Japan and Europe. I would wager Konami thought they could sell more copies in America by changing the title, given the political landscape between the U.S. and Russia. You play a solider that is armed only with a knife deep in enemy territory. Right from the start stealth is thrown out the window as enemy soldiers charge at you from both sides of the screen. You can dispatch them with the knife, jump over them, or run from them if they are coming at you from behind, but they never stop attacking. To make matters worse, there are also landmines littered about and enemies taking shots at you from guard towers, which will likely cause problems for you. If an enemy lands a hit, you instantly lose a life. There are no shields like in Gradius or an armor system like Ghosts ‘N Goblins. However, there are checkpoints. So if you lose a life midway through a stage, you’ll begin your next life at that point, not at the beginning of the level. It would be infuriating having to start over, and this system makes it fair and manageable. You begin the game with four lives, and once they are gone, it is game over and there is no continue system. There are several different kinds of enemy attackers. Early on, you mostly encounter foot soldiers that simply charge at you. They are pretty easy to fend off with your knife, but their numbers add up. Jumping soldiers present more of a challenge, as you have to leap and stab them. As you progress further, there will be armed enemies, both with pistols and machine guns. More and more difficult targets fill the screen, as you get deeper into the game. Killing certain soldiers will reward you with a power-up and there four total kinds of special weapons. If you pick up the bazooka or the grenades you get three shots. I always tried to conserve these for the more difficult fights found at the end of each stage. The other two power-ups include a pistol and an invincibility shield, but these are timed special items and disappear after a short time; much like the Star in Super Mario Brothers. At the end of each stage there is a boss or hordes of attackers serving as a collective boss. There are a total of six unique areas in the game, such as a forest, harbor, and airport. While the gameplay in Rush ‘N Attack is solid, the three things that really make this game standout from its predecessors are the graphics, sound, and the 2-Player co-op mode. Up to this point, most multiplayer games on the Nintendo have either been head-to-head sports titles, or ones that only featured an alternating 2-player mode. In Rush, you have the option to both play on the same screen as you work together to defeat the enemies and get through the areas. This is so much more fun than waiting for your turn to play, and also makes this very difficult game a lot easier to win. Also, if one player dies he respawns from that point instantly, rather than going back to the checkpoint, as in single player mode. If you are the competitive type, you can always race to see who gets the higher score. The graphics and visuals in this game are far superior from most other games on the NES. The levels are well designed and each has a theme. Each area is bright and colorful, and the objects are crisp and well animated. After awhile, the backgrounds on each level become repetitive and there is not much detail to your character or the enemies, but those are minor nuisances. In between levels there are exciting animations of your player entering the next area. Much like Gradius, the sound in this game is outstanding. It features some very catchy and memorable music that really seems to fit the action theme of the game. Unlike most Nintendo games, the tracks have some substance to them, and don’t loop every 10 seconds. Even the intro and Game Over tunes sound great. Compare this game’s visual and sound to Commando, a somewhat similar action game, and Rush blows it out of the water. This game is far from perfect, however. In fact when I first played it, I really didn’t care for it very much. The biggest reason came down to the controls. They are different than almost all other side-scrolling games on the Nintendo, and it took me awhile to adjust to them. To jump n this game, you must press up on the control pad instead of “A” like many of the other Game Paks. Instead, A triggers your special weapon, assuming you have one equipped. Jumping is an essential part of this game, so you need to master this strange gameplay quirk quickly to make any progress. I still find myself accidentally triggering the jump feature at inopportune times, resulting in me landing in a sea of enemies or on a landmine. Also if you jump forward and happen to hit a ladder, you automatically attach to it. In a game where timing is everything, these small hindrances can become annoying rather quickly. A misstep like that will almost always cost you a life. Like many other games of this caliber, sometimes the action can become repetitious, and continually stabbing the rushing attackers does become tedious at times. This isn’t helped by the constant reusing of backgrounds in the stages, which if you’ve been stuck for long periods of time can really grate on you. After finally acclimating to the controls, I ended up really enjoying my time with Rush ‘N Attack, both with a friend and playing solo. The game is very difficult, but not in the near-impossible league of Ghosts ‘N Goblins. I think it offers a very healthy challenge, especially with the lack of continues after a Game Over. I am very impressed with the music and graphics, and I hope this game raises the standard for future Nintendo titles. I think a little more story detail would have improved the experience as well. You are told you must destroy the Enemy’s Secret Weapon, but nothing else. Again, the 2-Player mode really is the selling feature in Rush. This is something I believe will really resonate with the gaming public and I hope to see scores of new games that capitalize on its cooperative style. Konami has released two solid entries on the NES, and they have two more titles coming soon: Track & Field and Castlevania. Hopefully they’re even better! Rush ‘N Attack is a quality action game on its own, but the 2-player feature is outstanding. Fun game play, setting, music, and graphics all make this a game that Nintendo owners should experience.